Bubba Carver (#2) and Paint Candy Flying (#3) battling down to the wire in the Retama Park Derby(G3) on Saturday night. SELMA, TX�JULY 27, 2013�Douglas Traylor's Bubba Carver rolled to his third consecutive win and fourth victory in five starts Saturday night following a nose victory over Paint Candy Flying in the $193,600 Grade 3 Retama Park Derby. Coming into the race with the fastest qualifying time, Bubba Carver rolled down the inside of the track under jockey Francisco Calderon to hold off a serious bid from Paint Candy Flying. As the $1.70 post-time favorite he stopped the timer in :19.851 seconds for the 400 yard course. Judd Keral trains the WAVE CARVER 3-year-old who pocked his richest payday ever at $77,440 to push his career total to nearly $125,000. Almost unstoppable this season his only loss was a fourth place effort in the Biscayne Stakes at Hialeah Park in January. Bob and Jerry Gaston bred the gelding in Texas from their Fredricksburg mare Rustys Lil Lady. He is from the first crop of the half-sister to World Champion Whosleavingwho and leading second crop sire Coronas Leaving You. The mare other three-year-old, Valiant Lil Lady won the Texas Classic Futurity(G1) last fall and has earned $491,519. Paint Candy Flying picked up $32,912 for owner Elite Oilfield Services. Alfredo Gomez trains the PYC PAINT YOUR WAGON gelding out of Fly Candy Fly, by Strawflyin Buds. Omar Ryes rode the $55,213 earner. Carl Pevehouse bred the 3-year-old in Oklahoma. Second fastest qualifier Dash For Coronas was another nose back in the show position. All three of the top three finishers earned a 99 speed index for their efforts. 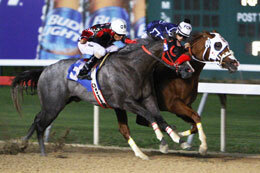 Javier Ramirez owns the Grade 3 winner of last season's Oklahoma Futurity at Remington Park. The $19,360 show check swelled Dash For Coronas' bankroll to $254,215. Carlos Gonzalez saddled the 3-year-old out ridden by Gaspar Garcia. Completing the Retama Park Derby field were Cc Wants It All, Knockout The Fire, Beastro, My Te Fast Cat, Find Me A Corona, El Duero and Flirtingwithamiracle.